Scroll down for the details about each Ultimate Success CD, listen to the FREE tips and read about the information they each contain. Click center arrow to hear! Running time: 1 min. 55 secs. Running time: 1 min. 54 secs. Almost all network marketing training programs will teach you to use various “sales and marketing tools” to build your business such as: a web site, email, conference calls, sales letters, a voice mail presentation, flash presentation, meetings, etc. Unfortunately, there’s a 95% chance that the sales and marketing tools you are using are ineffective. What makes them ineffective is that they are merely “informative” instead of being “persuasive”, in which case it will be virtually impossible for you to succeed in network marketing, as taught on Tracy Biller’s PERSUASION CD. Regardless of how hard you work or how much desire you have, you must use persuasive sales and marketing tools if you want to succeed in network marketing. This is proven by the fact that over the past 25 years distributors just like you who created their own persuasive sales tools earned most of the biggest commission checks. The bottom line is that the distributor who uses informative sales tools will almost always fail, while the distributor who uses persuasive sales tools will make a tremendous amount of money. Unfortunately however, most network marketers have no idea how to make their sales and marketing tools persuasive, because “persuasion” is a subject that is not readily taught in high school and college. And it’s certainly not taught in most MLM training programs. 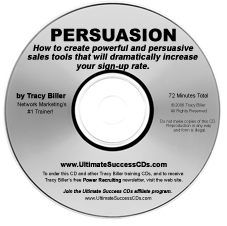 But with Tracy Biller's PERSUASION CD, you will learn just how easy it is to make all of your sales and marketing tools very persuasive. Plus, Tracy's PERSUASION CD will also teach you to communicate (speak and write) more persuasively for all areas of your business, and communicating more persuasively is indeed a very powerful skill that truly separates those distributors who actually make the big money from those who merely dream of making the big money. Running time: 1 min. 57 secs. Running time: 1 min. 49 secs. Over the past decade, most network marketing training programs have neglected to teach the subject of “sales volume”. Indeed, the subject of “sales volume” is a critical part of your MLM training. The reason is because if you want to make big money in network marketing, then you and your downline must produce lots of “sales volume” on a continuous basis, as taught on Tracy Biller’s SALES VOLUME CD. “You must understand that the money you make in network marketing – the amount that’s on your commission check – is based primarily upon the dollar amount of the sales volume that’s created by your downline network of distributors,” says Tracy Biller. Sales volume is the dollar value of the products or services your downline causes to be purchased from your company. Regardless of your company's pay plan, if your downline produces little or no sales volume then you will make little or no money. But if your downline produces lots of sales volume, then you make lots of money. 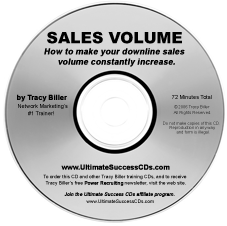 With Tracy’s SALES VOLUME CD you will learn specific strategies so that you can create and sustain your downline's sales volume. 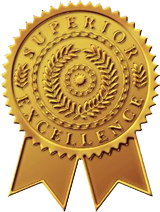 More importantly, you will learn how easy it is to implement the art and science of "pre and post promotion" so that your downline's sales volume will continually increase – month after month – to the point that your downline’s sales volume will grow exponentially at a faster rate than the number of new distributors coming into your downline. Once you've learned how to be the catalyst for causing your downline's sales volume to constantly increase, then the immediate result is that your commission check will grow quickly and it will continue to grow. The SALES VOLUME CD is one that every success-seeking distributor should have in their collection. Running time: 1 min. 53 secs. A key part of your network marketing training is the important subject of developing a defined business plan. Because if you try to build your network marketing business without a defined business plan – regardless of whether you are a part-time or full-time networker – then it will be nearly impossible for you to achieve exponential growth, which is necessary if you want to succeed and make big money in the network marketing industry. But when you develop and follow a "90-day blitz" business plan – as taught on Tracy Biller’s 90-DAY BLITZ CD – it forces you to have a disciplined application that is very similar to what a professional athlete does to prepare for competition. The results of designing and implementing your own personal 90-day blitz is that your downline, your sales volume, and your commission checks will grow quickly. Plus, at the same time you can achieve tremendous personal growth! As you will hear on Tracy’s 90-DAY BLITZ CD, many MLM training programs teach you that it takes “3-5 years or more to succeed in network marketing", however Tracy points out that this simply not true. The fact is that when you implement a 90-day blitz, both your personal and group momentum can be achieved in 90 days or less. 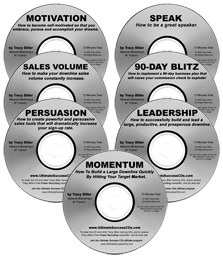 On Tracy's 90-DAY BLITZ CD, you will discover that it takes only one 90-day blitz to establish your personal and group momentum, that it takes a second 90-day blitz to advance your personal and group momentum, and that it takes a third 90-day blitz to sustain your personal and group momentum. That's it! Working your business within the framework of a 90-day blitz creates the results you desire. 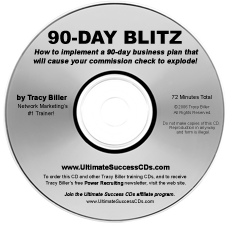 Tracy’s 90-DAY BLITZ CD teaches you this powerful and proven strategy that you and your downline should apply immediately, and keep on applying. Most network marketing training programs lack competent training in the area of self-motivation. This is unfortunate, because the fact is that you must be 100% self-motivated if you are going to get out of your comfort zone and succeed in network marketing, as taught on Tracy Biller’s MOTIVATION CD. When a person is entirely self-motivated, what happens as a result is that they automatically become self-responsible and self-functional, both of which are traits that are necessary to achieve network marketing success. “The fact is that self-motivation is the single most important character trait of a successful network marketer, yet most MLM training programs don’t include competent training on this subject,” says Tracy. “Sadly, people who have little or no self-motivation are scared of failure or they are scared of success. If a person is scared of failure and/or success, then the result is that they will not get out of their comfort zone to pursue their dreams, and they will fail.” Simply said, if you are not self-motivated, then it is a guarantee that you will fail in network marketing. On Tracy’s MOTIVATION CD, you will learn how to become highly self-motivated so that you automatically get out of your comfort zone to pursue and accomplish your goals and dreams. You will learn to conquer the fear of failure. Moreover, you will learn to embrace success! On this incredible MOTIVATION CD you will learn the techniques that Tracy used to stay self-motivated not only during his nearly five years of network marketing struggles, but also during his four years in which he built two huge downlines and became his company’s #1 earner. Tracy’s MOTIVATION CD is one that you will want to listen to many times in the months and years to come, and you will want your downline distributors to do the same! Running time: 1 min. 52 secs. Most MLM training programs don’t teach effective speaking. This is unfortunate because the success you achieve in network marketing and the money you make as a result is directly related to your ability to speak effectively to your prospects and the distributors in your downline, as taught on Tracy Biller’s SPEAK CD. “If you speak well then your prospects and your downline are naturally drawn to you,” says Tracy. “The result of you being a great speaker is that you’ll communicate more effectively, which means that you will sponsor many more people, you will lead your downline much more effectively, and you will make a lot more money.” Being a great speaker is a skill that most people are not born with. But the good news is that being a great speaker is indeed a skill you can easily acquire through specific knowledge and application. With Tracy’s SPEAK CD, you will learn the key elements and traits that will make you a great speaker, which will greatly enhance your effectiveness as a communicator whether you are talking with one of your prospects or one of your distributors, conducting a live teleconference, recording a voice mail message, or speaking to an audience at a network marketing meeting or convention. You will learn how to make your voice more appealing, how to speak with more clarity and inspiration, and how to speak more persuasively. Regardless of your age, background, or education, the fact is that you can become a great speaker in a short time by listening to Tracy’s SPEAK CD and applying what you learn. If your desire is to be a successful network marketer and make a lot of money as a result, then you must be a great speaker. 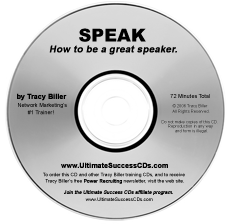 Tracy’s SPEAK CD will teach you how to become one in a very short time. This remarkable CD should be a part of both your’s and your downline’s MLM training.